Life in the world is overwhelming lately. It feels like all we can do to get through is to pray. Or let fear try to control our lives—which wrecks our brains and does the world no good and makes you lonely (must read this blog to make sense of that bold statement). But prayer does not seem like enough. Folks, it is. We need you to enter into this lifelong practice of prayer, calling upon a supernatural Higher Power to make sense of this crazy and fear-filled world. This is a lifelong practice because the answers come in the long term. Prayer is an act of dependence. And this may be the rub. Who likes being dependent? There has got to be something more I can do. Prayer feels like it is not enough. Prayer can make you feel like you are not enough in this big and fear-filled world. Prayer exposes vulnerability in us. We’d rather numb that somehow. Unless you are this person. The one who busily prays for everyone and everybody, even forwarding prayer requests from strangers and unverified prayer requests. It’s your way to do something while at the same time you are still numbing yourself from the pain of all these prayer requests. You keep yourself “busy” in prayer but it is not the wise and effective kind because you are numbing the dependency that prayer is. Truth is we are all dependent on this personal Higher Power to make sense of this crazy and fear-filled world. Our relationship with this personal Higher Power thrives when we enter into this prayer relationship with Him. This is how we learn how personally involved in our lives God is. As believers we’ve already made that vulnerable leap of faith to trust this personal Higher Power. We’ve grown in our dependency on the ways of God to navigate the bumps and bruises of our own lives. We’ve grown to learn that we have options besides just human limitations, we also have supernatural options. Suddenly our dependency actually makes our world wider and feel safer. 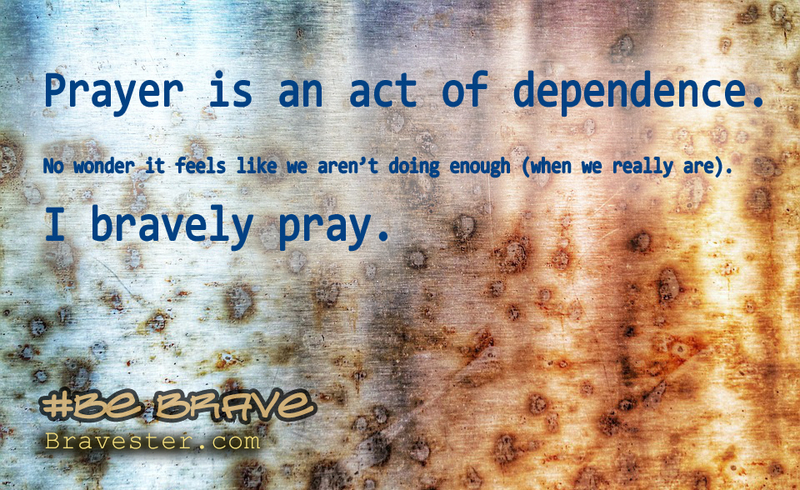 So we do this act of dependence and pray. This is why I say the brave pray. Vulnerability is really a position of strength. Vulnerability is you are capable of being wounded because you are worthy enough to be out there. You are worthy enough for God to answer your prayers. You are worthy enough to receive. You are worthy enough to find. You are worthy enough to have that door opened for you. You are worthy of every good gift God has for you. We need you to pray. Pray for me. Pray for us. Pray for victims. Pray for authority. Pray for wisdom. Pray for truth. Pray for discernment. Pray that love wins. Find your vulnerable bravery and pray. Thank you. p.s. When it feels like you are not doing enough, lean into the supernatural. This may lead you to do something. Praying and doing something are not mutually exclusive—and both require you to be hands-on.